Have you noticed that in the last ten days the press has been flooded with articles about the Doomsday Clock? Here are some of the titles: “The Doomsday Clock is the closest to midnight since 1953” (Engadget, Jan. 28, 2017), “Nuclear ‘Doomsday Clock’ ticks closest to midnight in 64 years (Reuters), “Doomsday Clock Moves Closer to Midnight, Signaling Concern Among Scientists (The New York Times, Jan. 26, 2017), and “The Doomsday Clock is now 2.5 minutes to midnight, but what does that really mean? (Science Alert). The Doomsday Clock was created in 1947 by members of The Bulletin of the Atomic Scientists’s Science and Security Board; several of them were part of the “The Manhattan Project” that led to the creation of the first atomic bomb. (For those of you who want to learn more about “The Manhattan Project,” I recommend a drama series that premiered in 2014; although the series was discontinued after the second season, it featured good acting and it was fun to watch. Also see Jack Davis’s Communism In and Out of Fashion, Sept. 1, 2016.) “Originally the Clock, which hangs on a wall in The Bulletin’s office at the University of Chicago, represented an analogy for the threat of global nuclear war; however, since 2007 it has also reflected climate change and new developments in the life sciences and technology that could inflict irrevocable harm to humanity… The Clock’s original setting in 1947 was seven minutes to midnight. It has been set backward and forward 22 times since then, the smallest ever number of minutes to midnight being two in 1953, and the largest seventeen in 1991” (after Wikipedia, accessed 28/1/2017). As of January 2017 (and this explains the flurry of articles in the press), the Clock has been set at two and a half minutes to midnight, a reflection of President Trump’s comments about nuclear weapons: “The United States must greatly strengthen and expand its nuclear capability until such time as the world comes to its senses regarding nukes.” Trump posted this remark on Twitter on December 22, 2016, and followed it with an even more worrisome comment: “Let it be an arms race,” he said, referring to the Russians. 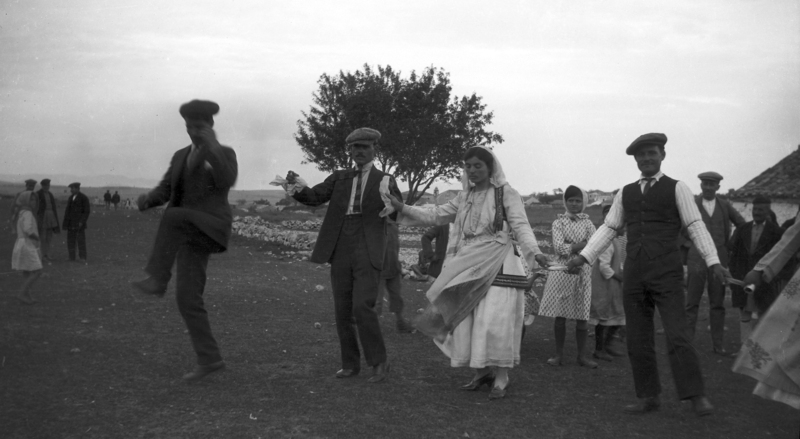 Dorothy Burr photographing wedding dance at Parapoungia 1924. ASCSA Archives, Dorothy Burr Thompson Photographic Collection. “By myself in a Boeotian village, with the cry of the wind and drunken men in my ears! I love this place; it is so full of interest and a sense of real thing – seeing weddings whereat one reddens a finger… plodding one’s weary way homeward over purple fields to the din of bells like an organ cadence, knowing villagers… Oh, it is so full of life…” scribbled Dorothy Burr in her personal diary on November 9, 1924. Vivian Florou here contributes to From the Archivist’s Notebook an essay about Anna Apostolaki, one of the first women to graduate from the University of Athens and in 1926 the first curator of the newly established Museum of Decorative Arts. 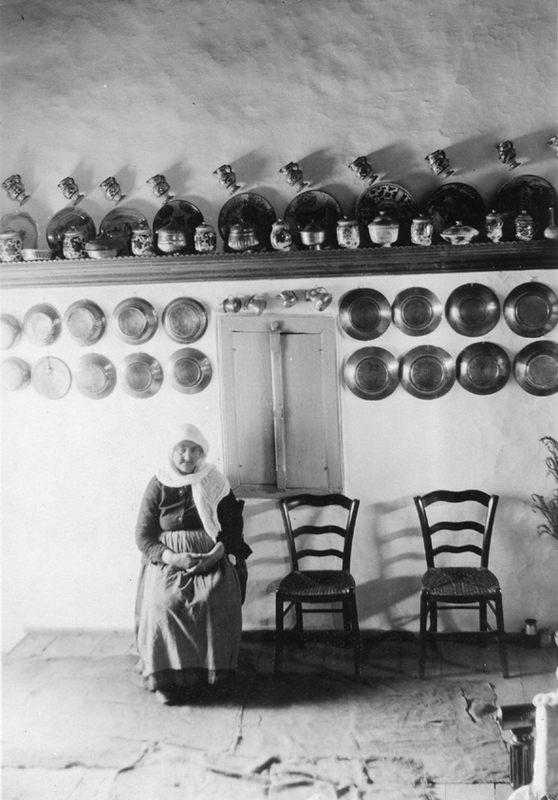 Her essay not only sheds light on forgotten aspects of Apostolaki’s life and work but also places this remarkable woman in the cultural milieu of the early decades of the 20th century and at the center of the feminist movement in Greece. Vivian, who studied archaeology and cultural heritage management, co-edited with Natalia Vogeikoff-Brogan and Jack L. Davis, a collection of essays titled Carl W. Blegen: Personal and Archaeological Narratives (Atlanta 2015). Vivian Florou here contributes to the Archivist’s Notebook an essay about high-society Greek women in the decades between the two world wars. The traditional festive costumes that they wore on their social outings defined the aspirations of their class. Florou explores this fashion trend within the intellectual context of the period and the so-called “Generation of the Thirties.” Vivian, who studied archaeology and cultural heritage management, co-edited with Natalia Vogeikoff-Brogan and Jack L. Davis, a collection of essays, entitled Carl W. Blegen: Personal and Archaeological Narratives (forthcoming later this year). In that volume she explores the social life of two American couples (Carl and Elizabeth Blegen, and Bert and Ida Hill) who lived in the neoclassical mansion that now houses the J. F. Costopoulos Foundation on 9 Ploutarchou street in Kolonaki, Athens. From their names on the sketch we learn that these were women of the Greek elite of that period. What were they doing dressed in clothes so foreign to the experiences of their daily lives? Why were they swirling the heavy fabrics of their garments amidst the foreign representatives? Did their behavior simply reflect a folkloric movement or was it an expression of “committed art” set against an historical backdrop? This clipping from Πρωΐα of 1931 inspired me to look for photographs that shed light on the appropriation of folk art by the Greek bourgeoisie in the interwar period (1919-1938), but also earlier, in the 19th century.